My friend, the novelist Wallace Stroby (“The Devil’s Share”), is an inveterate collector of novelizations, and something of an expert on same. Stroby points out that novelizations flourished during a time before home video and YouTube, when opportunities to somehow relive a beloved current movie (short of buying another ticket) were rare. Stroby adds that novelizations were often written by known novelists under nom de plumes. He learned that Alexander Edwards is a pseudonym for Leonore Fleischer, a prolific writer of novelizations (some under her real name). In those days, novelizations were sometimes written off of screenplays that weren’t yet finalized. Thus, there could be differences between what you saw on screen and in print. “McQ,” the paperback, has several glaring such instances. ■ The paperback McQ doesn’t live on a boat. ■ McQ’s preferred gun, identified as an Ingram 9mm in the movie, is a Mauser in the paperback. ■ The big showdown, which takes place along Pacific Ocean beaches in the movie, happens at a salt-processing plant in the paperback. ■ At the end of the film, when McQ’s old boss Captain Kosterman offers McQ his badge back, it’s implied that McQ accepts it. In the paperback, he flatly turns it down. McQ later tells private eye Pinky there still must be someone higher up in the police department’s chain of command who orchestrated drug heists and cop killings — and McQ aims to find him. McQ as described in the paperback: McQ was a man who resembled most closely a mountain that had seen the weathering of thousands of years. A huge man, six feet five and made of stone, he had a weatherbeaten face with crags instead of features. Engraved deeply into it was a weariness borne from long years of hard, frustrating work. 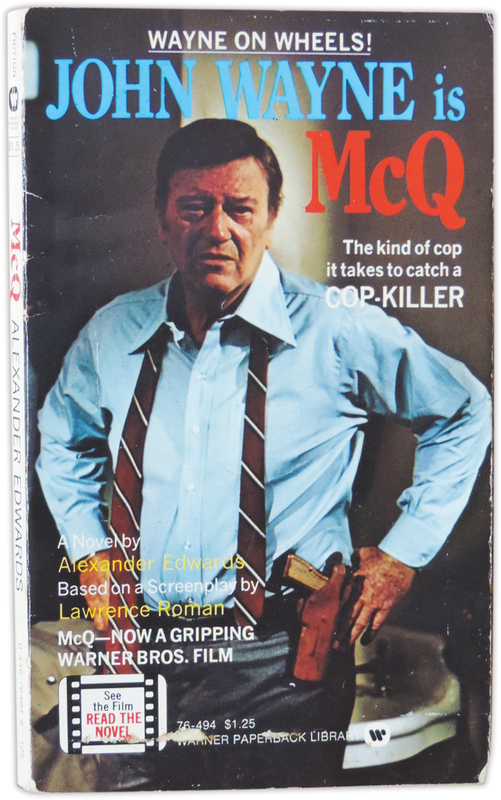 For, although McQ was a cop in the deepest, most old-fashioned mold, he was also a loner, a maverick with his own way of doing things.